Gareth, you’re one of the first runners to meet their fundraising target. What’s the secret of your success? When I signed up my wife very wisely advised that I start sharing the fundraising page as early as I can. That allowed me to get a head start on raising the money and then to focus solely on training for when the time comes. This is a piece of advice I would pass on to anyone else. I’ve been blown away by the generosity of friends and family and I can’t believe how quickly the target was hit! What motivated you to sign up for #TeamCardiff? Running for cancer research at Cardiff University appealed to me as, like so many people, cancer has had an impact on my friends and family. My Grandad lost his life to cancer and my stepdad is currently fighting a battle against it, and not for the first time. 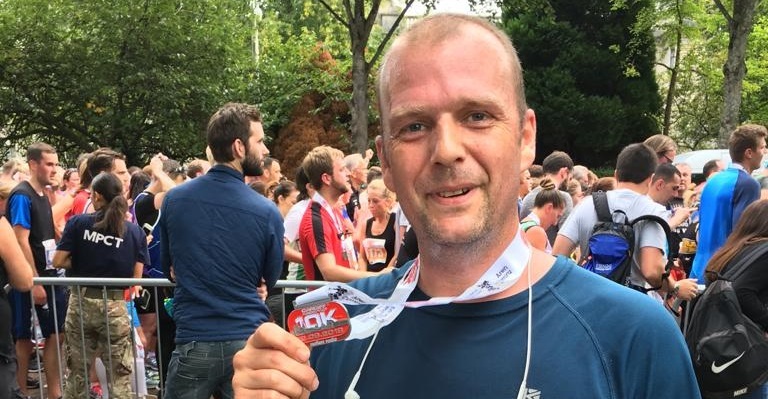 Last year I completed the Cardiff 10K and the Half Marathon was the logical next step. When I learnt that I could represent #TeamCardiff and raise some money for a good cause it seemed like the right thing to do. Besides, I love a free t-shirt! How are you feeling about race day? My Gran recently passed away and the race itself falls on her birthday (6 October) so that will be a big motivator to perform well. I’m not really feeling nervous yet but I’m sure there will be nerves in the days leading up to it. I did find that being a part of a huge crowd of runners was a big help during the 10K and looking at the pictures of last year’s Half Marathon, the atmosphere looks incredible. That will be a big factor. How’s the training going? Any #TeamCardiff tips? I’ve not started any specific training yet. I do try to run 3 times a week to keep fitness levels up so I run 10k on a Monday and 5k on Wednesdays and Saturdays, taking part in local Parkruns when possible. I don’t want to peak too soon so will start the half marathon training 8 – 10 weeks before the big day. If all goes well I should be in top condition and I’d love to complete the course in less than 2 hours. I feel like a rookie still myself so don’t really have any tips or tricks! I do think that music is really important when training; I’m really into skate punk, which is a bit too fast for running to. I often find myself speeding up far too much when the riffs kick in!